The week it was revealed that Jennifer Aniston hired an ‘Interior Therapist’ to rid her home of ex-husband feels like a great time to announce that I’m available on a day rate too. Let me breathe new life into your home! I’m no Hollywood house shamen on a Gwynneth or Jen scale, but what I lack in performance rituals, I make up for in styling tricks that are sure to make you fall back in love with your home. We’ve all been there. We open a wardrobe bursting at the seams with clothes only to decide we’ve got nothing to wear. 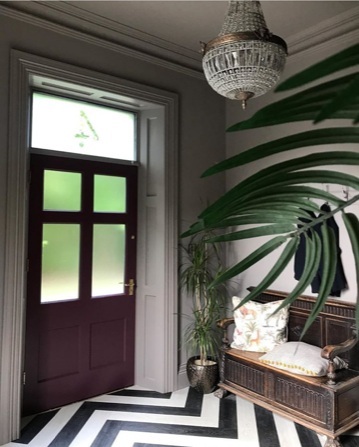 We glance around our tired looking house and it’s, well it’s fine isn’t it?… but it’s not quite doing it for us the way the cool houses on Instagram do. Before we know it we’re in full on identity crisis meltdown. We roar at the kids, we burn the dinner, we step in the dog bowl. Life is suddenly a pig and all that January detoxing was for nothing. “POUR ME A WINE” we holler at a frightened looking OH. I styled my home out of an identity crisis and through it developed a much stronger sense of who I am and how I want to express myself. Now I’m offering out my time to help others do the same through my new consultancy service My House Candy Home Styling. Renovating my period property taught me everything there is to know about giving a home its personality back. This experience, coupled with five years on the interior blogging circuit has made me one of those annoying people that can name a wallpaper design at 10 paces. Say to me you want wall lights with wow factor, I’ve seen ‘em. Statement abstract artwork, I’ve ogled it. Paint colours to soothe, to invigorate, to cope with dog sick… I’ve already stressed about them, so you don’t have to. Sometimes style ruts happen without us even realising it and nobody is judging, least of all me. After we have kids and our homes fill up with plastic and we become grateful for the functional things like wipeable tablecloths and wicker storage boxes. We don’t have time to plan a gallery wall or source a faux fern for the fireside FFS. Home style ruts are happening all around us and the busier we are, the harder it can be to get out of one. My House Candy Home Styling is designed to take the leg work out of nailing your home style. I’ll help you pull a look together that has your personal style stamped all over it. It might be that the furniture is fine but you need help sourcing wallpaper and accessories that complete the picture. You may have a clean slate to decorate and no idea where to start. Or you may have done a total house redecoration and there’s just something missing that you can’t quite put your finger on, so you need a fresh pair of understanding eyes. Well here, borrow mine. For those of you that don’t know me, I’m based in West Yorkshire but lots of this can be done remotely, so if it’s a bit of style confidence you’re lacking, please get in touch at: myhousecandy@gmail.com. My job will be to source the best House Candy to suit your style and budget. I will even source one-off vintage pieces or secure those Ebay bids that will give your space a totally unique edge. My aim will be to define your signature home style and steer you in the right direction, so that that you can build on it from room to room. Not only will it save you hours of screen or showroom time, but it could also save you big bucks in costly mistakes too. Watch this space for details of some exciting projects I’ve been working on. I’m so excited to share them with you. In the meantime, here’s how I took my house from Meh to ME. 3) Made lighting my best friend. 4) Ensured good first impressions in the entrance hall. 5) Created harmony between my homes past and its future. My House Candy Blog is where you’ll still find me gushing over some hot homewares or showing off a fabulous junk shop find. This won’t necessarily be the most luxurious or the most fashionable thing your home could ever flaunt, but it will be what my style instinct pulls me towards. You’ve got that instinct too and once you discover it, decorating will become a whole lot more fun!